This was a one point game and as such you would not expect much between the teams. 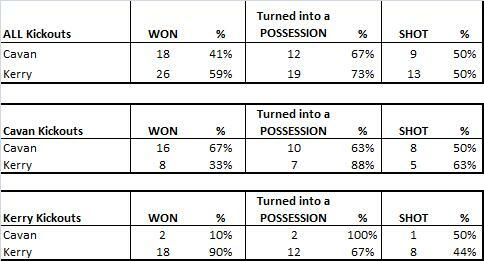 The possession count was very similar whilst both teams had the same number of shots. Mayo had a better conversion rate which would indicate that they were sharper shooters on the day however the weighting suggests this was far from the case. Stats eh? Firstly the possessions; closer than you thought whilst watching the game? It surprised me. One of the reasons for this was how slow Dublin started. Immediately prior to Brogan’s first goal Mayo led the possession battle 13-5. They were dominant taking ten shots to Dublin’s three and leading 0-05 to 0-01. Of course the corollary to that is Dublin won the possession battle 35-26 from there on in and took 24 shots to Mayo’s 17. It is the prolonged period of Dublin dominance we (or rather I) remember rather than the game as a whole. Back to the shooting. Mayo’s Success Rate was better than Dublin’s however their weighting was quite negative. How can Dublin have one less conversion than Mayo, plus three extra misses, yet come out with a better weighting? The answer is in the type of shot both teams took. We will deal with the deadball shooting in more detail below however Mayo only converted two shots from play from outside the 20m line. These two shots both came from Sector5 – directly in front of goal. Their converted shots were not difficult and therefore the weighting for these shots was not able to cancel out the negative weighting for their misses (nine in total; four inside the 20m line and five outside). Contrast this with Dublin. They had essentially the same Conversion Rate as Mayo but they hit some majestic points. In the second half alone Andrews, Flynn, Brogan & Brennan all hit wonderful shots with three of the four coming from the wings. Dublin’s scores were more difficult and able to make up for their misses. Another way that Dublin’s weighting was helped was in their shots at goal. They took five in total scoring on three (O’Gara’s shot ended up being a point). Over time we have discovered that shots at goal are converted much less than shots for points therefore the weighting takes this into account – you are better rewarded for converting the harder shots and not penalized for missing as much. Dublin had more shots at goal whilst Mayo did not attempt enough ‘difficult’ point attempts. The type of shot had a big bearing on why Mayo had a better conversion rate than Dublin but ultimately were less efficient. The average number of shots at goal from deadballs in a game is 13.8 so whilst 16 is on the high side it is by no means outlandish. There were 15 in the 2012 All Ireland final. In that 2012 decider Mayo only gave up 6 scoreable dead balls – they went one better here only offering up Dublin five kicks at goal; this against a team that were averaging nine shots at goal from deadballs prior to the final. Mayo’s tackling has been excellent all year and held up under the pressure. O’Connor scored eight frees, and was the main reason that Mayo were able to stay with Dublin in the second half, yet he had a poor outing by his own lofty standards. How so? O’Connor, with Cluxton & the two Donegal snipers, is the best deadball striker over the past two years. The eight frees he converted were all very simple (six from in front of the posts) and any free taker, let alone a pre-eminent one like O’Connor, would be expected to make them. The problem arises from the two he missed. The first is excusable as it was very tight to the touch-line on the 20m line (there is an argument as to whether, given the chance of success, teams should have a short kick routine ready for such scenarios – but I digress) however the second was from Sector 5 straight in front of the posts. On average that free kick is converted 85% of the time. The eight he converted were cancelled out by that miss weighting wise. Dublin will not care but giving away eleven shots from deadballs was poor. A crude and effective way to protect the lead no doubt but as a unit not one I imagine they’ll review too often. Just to re-emphasis some of the points mentioned above. 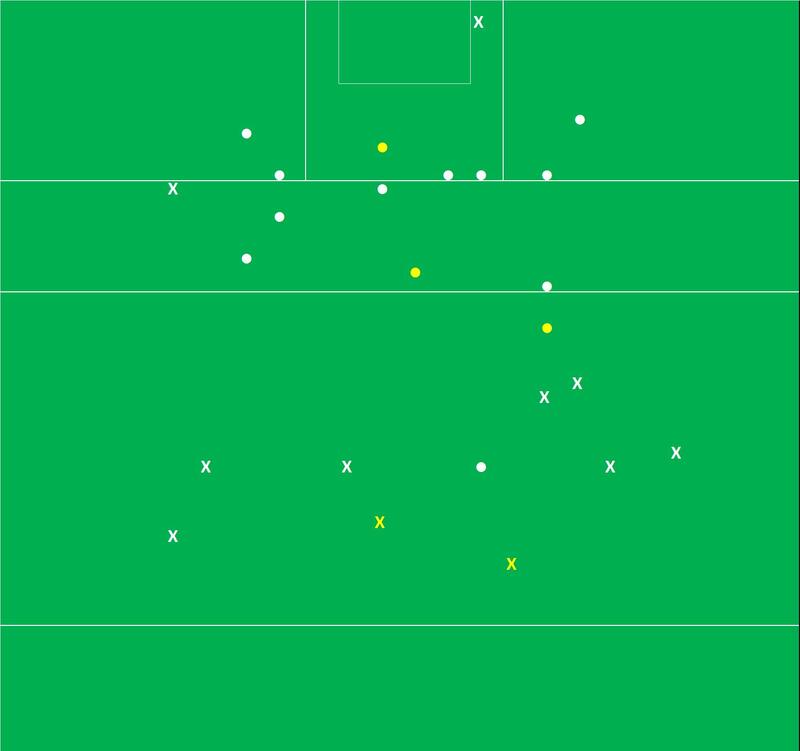 Look at Mayo’s second half attempts (white = 1st half, black = 2nd half) – very conservative with not one attempt from play from outside the 20m line. The above table shows the importance both teams placed on winning primary possession. 86% of all kickouts were won by the team taking the kickout. Part of the argument for going shorter with kickouts, and thus securing possession, is what happens when you don’t. Of the six kickouts lost by the team taking the kickout 5 were turned into an attacking possession whilst 50% were turned into a shot. Only 38% of those kickouts won on your own kickout were turned into a shot. The overall shot rate for the game, at 68%, was low and thus the conversion of kickouts won to shots is also going to be low. Dublin however did perform better here getting nine shots off from the twelve possessions they had as opposed to Mayo’s five from twelve. Moran had an absolutely superb display for Mayo. Apart from scoring 1-02 he was also directly responsible for winning two frees that O’Connor converted. In the two years that this blog has been up and running Bernard Brogan has probably been highlighted more than any other player. It is only right that we highlight how good a game he had on the biggest stage. He had seven shots in total, scoring 2-03 and his first goal, whilst Mayo were dominant, was *the* key turning point in the game. In the NFL there is a “book” that tells coaches the optimum strategy for when to for a 2pt conversion after a touchdown or when to go for it on 4th and short versus taking a field goal. In the off season some team needs to develop something similar for GAA managers. Mayo & Dublin is the final that most people wanted. They have consistently been the two best teams this year and most pundits are struggling to separate them. Given the expected closeness we prise open some elements to see if either team has that crucial advantage that will see them over the line. The below table shows the averages for both team’s five Championship games in 2013. The view of Dublin being an offensive juggernaut is borne out by the fact that they have averaged 45 attacking possessions a game. The 2012 average was 35. This average does not hide any poor performances either – all five games have been above average with returns of 49,46,47,44 and 39. What we mustn’t do however is sleep on Mayo as an attacking threat. Their five game average of 43.2 is impressive in its own right and again all five games have been above average. Their weighting is slightly below Dublin but nothing that would indicate Dublin have a large advantage in terms of shooting prowess. What seperates the two teams, in an attacking sense, is what they do with the ball in an attacking position. Dublin have a better Shot Rate than Mayo, gaining on average an extra 3.4 shots per game, however their accuracy lets them down. If a team performs to the average then 3.4 shots should equate to an extra 1.7 scores however Dublin are only outscoring Mayo by 0.2 scores. There is very little difference in the two team’s accuracy when going for a point. Mayo score on 51% of their shots compared to Dublin’s 50%. Instead Dublin’s accuracy “issues” stem from their relative lack of composure when going for goal. They have had 36 shots on goal but only converted 31%. Mayo on the other hand has had 21 attempts at goal converting a very healthy 57%. When compared to the offensive outputs the opposite is true of the defences. As can be expected given the generally open nature of their games Dublin allow the opposition three more attacking possessions than Mayo do however it is the Dublin defence that limits the number of shots that emanate form these possessions. So Dublin are better at preventing shots however Mayo’s opponents had a much lower Success Rate and Weighting. Was this due to Mayo’s defending or a general lack of quality on the opposition’s part? There are two possible ways of measuring this. The first is the percentage of shots that the opposition took under pressure and the second is where they allowed shots from. Mayo’s defence applied pressure to 60% of all the shots for a point rising to 62% for all shots. Dublin’s defence applied pressure to 49% of their opponent’s attempts at a point dropping slightly to 48% for all shots. Both teams’ defences have quite similar profiles when it comes to where they allow their opponents to shoot from. What is interesting though is that in the better scoring zones (sectors 5 & 8) Mayo’s opponents perform much worse. It is of course possible that their opponents were just poorer shooters than Dublin’s opponents however I would ascribe the differences to the different set ups. Mayo provide support for the defence thus enabling them to pressure more shots. Dublin on the other hand tend to leave their defenders on an island. The positive returns for Dublin’s opponents in close lend credence to this view. Despite the fact that their overall Success Rates are quite similar when going for a point is there anything in the detail that separates them? Mayo take more of their shots closer to goal; 45% of all their shots versus Dublin’s 38%. Generally this is a good thing as being closer to goal ensures more accuracy however Dublin have a better Success Rate closer in (55% versus 51% for Mayo). Worse again for Mayo only 45% of those shots inside 20m came under pressure; 63% of Dublin’s were taken under pressure. Both teams’ have similar Success Rates from outside the 20m line. Again Dublin’s shooting has faced more pressure in these positions; 45% of these shots were taken under pressure versus 41% for Mayo shots. So whilst the overall conversion rates slightly favour Mayo the details show that they have faced less pressure taking their shots and have also missing more close in. Fine margins they may be but it is in the detail that this game will be won or lost. To date Mayo has had a distinct advantage in deadball (frees & 45s) striking when viewed by Success Rate. They have converted 76% of their deadballs with O’Connor converting all of his 12 attempts to date. If however O’Connor is unable, for whatever reason, to take responsibility for Mayo’s deadball striking then their advantage disappears. Although Freeman stepped up against Kerry, converting four from five, the team outside of O’Connor has only converted 64% and has quite a negative weighting. They have missed some very easy frees. Dublin has converted 67% of all their deadballs but what Cluxton has been excellent at is converting 45s. Cluxton has converted 73% of Dublin’s 45s (8 from 11) thus usually negating an excellent defensive play from the opposition. Of course the corollary to this is that Dublin’s free taking has not been as good in comparison. In the 5 games they have only converted 65% of their frees with Mannion only hitting two from six from the left. One of the most interesting battles on Sunday will be the kickout battle. Dublin is acknowledged as the leaders in how to control the kickout and to date they have won possession on 69% of their own kickouts. This is quite high however Mayo has secured possession on 78% of theirs. Part of this high possession rate is Mayo’s strength around the middle, with the O’Shea brothers patrolling and McLaughlin roaming, however their strategy also has a part to play. If a team takes a large portion of its kickouts short then it can be expected to “win” the kickout battle. Mayo has taken 41% of all their kickouts short as opposed to 29% for Dublin. When converting those possessions to shots Dublin is a step ahead. Dublin converted 58% of all the possessions from their own kickouts to shots versus Mayo’s 52%. The main difference, as can be viewed in the above table, is when Dublin hit medium length kickouts (between the 20m & 45m lines). Two thirds of the time when Dublin gain the ball in this area they get a shot off. To date Mayo has faced 38 kickouts in this area and have only given up nine shots (24%). This is the kickout battle. Dublin like to ping kickouts between the 20m & 45m lines. They are excellent at getting shots from here. Mayo however has shown that they can stop you from getting shots from this area. Can they do the same to Dublin? Just a quick note re the numbers. Like Kevin Reilly’s goal for Meath McMahon’s point is not included in the below numbers as it was not a shot. Dublin’s shooting was superb and the weighting is second only to Mayo’s demolition of Donegal. All aspects of their shooting were above average but to have a Success Rate of 63% on so many shots is quite remarkable (Mayo had a Success Rate of 64% on 21 shots). Kerry’s shooting was also good, with their shooting from play being very good, however the volume of possessions is what cost them in the end. In the first half the split of possessions was Dublin 18 Kerry 19. The second half? Kerry had 11 (!) and Dublin 21. Dublin were excellent in that second half but if Kerry could have only maintained an average pace in the second half they may well have put Dublin to the sword. The shooting from play was a joy to behold and the performances were the highest combined in any game. Dublin’s weighting was built on two main aspects. The first was their conversion rate when going for goal – six shots resulting in four scores (3-01). The second was their exceptional point taking out the field. At a high level c41% of all shots taken from play between the 20m & 45m lines are converted. Dublin converted a phenomenal 63% (8 from 13). Brogan had 5 such shots (from play between the 20 & 45m lines) converting four of them. He missed closer in whilst going for goal but it was great to see him at his natural point scoring best. Kerry for their part had a very good day as well however they were in some ways the mirror image of Dublin. They only converted 13% (1 from 8) of the shots they took outside the 20m line. There was no one culprit with six separate players shooting and missing from this range. Of course what that means is that to have such a good overall weighting they were deadly accurate inside the 20m line. They scored 2-08 on twelve shots but perhaps more interesting for the upcoming final is that despite being that close to goal Dublin only pressurised 42% (5 of 12) of those shots. The first point to note is the relative lack of shots at goal from deadballs. The 2012 average was just below 14 a game; we had a relatively small 10 in this game. Part of the reason for this was Cooper’s influence on Kerry in the first half. I counted three times that a Kerry player was fouled in and around the 45m line where most teams would have put the ball down and let their long-range free taker have a shot. Instead Cooper took a quick free that ultimately resulted in 1-02 for Kerry. Though there were no spectacular individual returns Kerry will be disappointed with the timing of their two misses. Both Cooper & Buckley missed straight forward frees in the last ten minutes of the first half when they could have easily stretched their lead. Kerry’s deadball striking has been something the blog has keyed in on previously. They were poor up until the last two games where they hit 93% (17 from 18) however the two misses, Buckley’s especially, show that the issue has not gone away. The shot charts highlight the aforementioned mirror image of the two team’s shooting outside the 20m line. Yes Kerry had seven less shots but they did have their chances. Looking purely at the volume of kickouts won you would be excused for thinking that Kerry did very well against the much vaunted Dublin strategy. They basically broke even. However dig a little deeper and you will find that Dublin did indeed win the strategic battle. From the possessions immediately gained from the kickouts Dublin managed to get five extra shots. Considering that Dublin had seven extra shots in total their kickout successes were a major part in ensuring they had the volume of shots to overcome Kerry. Kerry went short on nine of their kickouts (32%) gaining possession on eight (the ninth was kicked out over the sideline but no damage was done). Surprisingly Kerry only managed to get two of those eight possessions into Dublin’s 45m line. They got a shot off from both. As a comparison Dublin went short on eleven (48%) of their kickouts gaining possession on ten. Of the ten six ended up being a possession and again all six resulted in a Dublin shot. Even though Dublin eventually let in a goal from the one short one that went awry they still managed to get four more shots off from the possession directly from short kickouts. It is becoming a bit of a band wagon to call for Rock to start in the final but the numbers do confirm what the eye indicates. Both team’s Shot Success Rates were quite similar however Tyrone just did not have enough shots. Mayo’s poor weighting shows that they had a propensity to miss easier chances (McLoughlin & Varley missed frees come to mind) but Tyrone took nine less shots. There was just no overcoming that level of a deficit without Mayo’s shooting imploding. It was more Mayo’s accuracy, than their shot count, that kept Tyrone ahead in that first half. Once their accuracy picked up they started to pull ahead. Tyrone’s shooting from play was much better than Mayo’s – at the risk of repeating myself they just did not have enough shots. No one player dominated the shooting from either team with Varley’s four shots topping the returns. Whilst his radar was off Dillon, Barrett & Keegan’s were very much on. The spread of shooters between the teams was quite similar with 13 from Mayo, and 12 from Tyrone, taking a shot. Coming in to the game Mayo’s shooting had only faced pressure on 38% of shots. In this game Tyrone pressurized 61% of Mayo’s shots (14 of 23) which will be a factor in the poor weighting. Conversely the Mayo defense had pressurised 67% of all their opponent’s shots from play but only pressurised 44% (8/18) of Tyrone’s shots. Deadball striking is possibly one area of concern for Mayo heading into the final. O’Connor, including this game, was 100% (12 from 12) from deadballs. Prior to last year’s final I was worried about Mayo’s free taking from the right hand side. Since then McLoughlin had stepped up hitting 100% in the three Connacht championship games (6 from 6) however he has hit two terrible frees, one against Donegal & one from basically in front of the goal here. After that miss Varley stepped up as the left footed free taker however he missed his two attempts. A bright note for Mayo was Freeman’s free taking. Stepping up unexpectedly he scored an excellent penalty as well as slotting three from three on frees. His only miss was a 45 with the last kick of the game. In a two game stretch against Meath & Kildare McCurry & Cavanagh hit 89% between them (16 from 18). Tyrone could have really done with some of that accuracy here. Either side of the goal both McCurry & Cavanagh missed frees that Tyrone really needed to keep tabs with a resurgent Mayo. In a game where they had nine less shots Tyrone could have really done with the Meath/Kildare output rather than the 43% return (3 from 7, weighting – 1.898) they had here. The volume of kickouts won is a stat that becomes less meaningful the more short kickouts there are. 41% (20 of 49) of all kickouts in this game were short with only one not resulting in the kickout team gaining possession. Mayo had 11 short kickouts and were very successful with them – they managed to get a shot seven times (64%) from the possession that ensued. Tyrone on the other hand only managed to get three (33%) shots from their nine short kickouts whilst also conceding a shot to Mayo on the one that went astray. Mayo’s weighting is, by far, the best return of any team. An easy argument to make is that, with the game over as a contest quite early, there was no pressure on Mayo. They argument being that they were able to shoot at will however the weighting does take the game situation into account. Any scores, achieved whilst in front, are treated less favourably than those achieved whilst chasing a lead. Another element that helps the weighting is that they took so many shots at goal. Mayo took nine shots for goal, converting four, but because they went for goal the misses are not treated as severely. With all that said Mayo’s shooting was just simply immense. As stated above excellent shooting from Mayo. They had nine shots at goal, converting the four, but more impressive was their 70% strike (14 from 20) rate when attempting shots for points. When the game was there to be won, in the first half, Mayo hit a whopping 80% (8 from 10) when going for points. Interestingly Mayo’s shooting was worse in the second half, when there was less pressure both mentally & physically. Of their ten shots in the first half Donegal pressured six; of Mayo’s ten shots in the second half Donegal only pressured three but Mayo converted two less. Donegal’s weighting is just above average but, like all their previous games, they just didn’t take enough shots. Also whilst Mayo were streaking ahead the little bit of pressure Donegal could have applied was squandered as they only converted one of their first six shots from play. A quiet enough day which is in no small part due to the uncompetitive nature of the game for 50 minutes. McLaughlin hit a very poor free at the start of the second half however that was the first one he has missed in this year’s Championship. O’Connor was again excellent and is now 100% this year (11 from 11). Murphy had a good day from deadballs but it is a testament to the Mayo defense that McFadden never had a shot. Donegal had 14 kickouts in the first half with Mayo winning possession on eleven of them. Donegal found it incredibly hard to get out of their own half, breaching the Mayo 45 a mere ten times in the first half. It was from this position of strength that the platform was laid for Mayo’s first half attacking onslaught. Another excellent day from O’Connor whilst Dillon’s two points in the first half were very good and shows that his shooting performance against London was just a blip (he only attempted ne shot which was missed). Perhaps more impressively from a Mayo standpoint is that nine players had only one shot with seven converting, This has echoes of the confidence flowing through Donegal’s game last year when the likes of McLoone, Thompson & McGlynn were aiding the front three. Excellent accuracy from Kerry converting 58% of their shots however there was a real divide in their shooting from play (39%) and their deadball shooting (100%). Their Shot Rate was low, which may be in part due to a lacklustre second half (it was 89% in the Munster final), but if it were to be repeated against Dublin it would put huge pressure on the accuracy as they attempt to keep pace. Cavan’s shooting was poor but not as poor as the weighting would suggest. They got penalised very harshly for Mackey’s attempted blast with the last kick of the ball but still they had the chances to put Kerry under more pressure than they did. The difference can be summed up in a cameo between Buckley & Reilly. Buckley had two 45s and a free in quick succession in the first half – he slotted all three enabling Kerry to build a lead. Reilly similarly had a long-range free and two 45s in quick succession in the second half as Cavan chased the lead. He converted one. Of the 18 shots that Kerry took Walsh accounted for six of them. That left 12 further shots spread out amongst ten different players. The five remaining forwards had combined returns of three from seven (Conversion Rate 43%; weighting -0.4805) … given the expected volume of shots that Dublin will bring Kerry will either need to up how many shots their marquee forwards take or their accuracy is going to have to increase greatly. Although Cavan had enough shots to be closer to Kerry their two main men, Dunne & Keating, only had four shots with Dunne converting one. Whilst Kerry went on their nine point unanswered run in the first half they took 14 shots compared to Cavan’s two. Cavan were simply over run for that period and were never able to adequately make up the deficit despite their resurgence in the second half. As an aside Kerry did something similar to Cork towards the end of the first half in the Munster final; they led the shot count 11-2 for the last 15 minutes of that half. In the last two games those problems have disappeared with Kerry converting 8 from 8 in this game and 7 from 8 in the Munster Final (combined conversion rate of 93%). Part of this is sample size, part is the natural ebb and flow of form but perhaps in this case part can also be attributed to a change in kicker. Whilst only one game Buckley’s long range performance was, much like Cluxton for Dublin, the pillar on which Kerry’s early lead was built upon. If we excuse Mackey’s blast at goal towards the end then Cavan’s shooting from frees & 45s was average. Kerry fairly well lorded their own kickouts winning possession from 90% of them. They went short on 55% (11 of 20), securing all of them, however won the possession battle 7-2 when they went past the 45m line as well. They got a shot off from 45% (5/11) of their short kickouts and 43% (3/7) of the long to medium kickouts they won. Although there was not much difference in returns mixing up the kickouts does ensure that Dublin cannot key on any one facet. Against Cork Kerry only went short once out of 24 … by varying the tactic in this game it gives Dublin something extra to think about. Cavan went short on 54% (13 of 24) of their kickouts. The messed up the first one but got a shot off on seven of the remainder. When Cavan went long they actually lost the possession battle 4-7 giving Kerry four shots and only managing one themselves. Cork’s metrics were average except for the weighting … such a positive weighting on average Shot Rate & Success Rates indicate the difficulty of some of the shots they converted (think of O’Rourke’s monster punt from outside the 45). For the second game in a row Dublin’s weight of possession (44 here, 47 against Meath) and shots (35 here, 39 against Meath) meant that they could overcome below average Success Rates to prevail. Given that Cluxton had such a super day from deadballs it is evident that Dublin’s shooting from play must have been poor to return an average weighting overall. More on that below. A lot of Dublin’s negative return here can be placed on their inability to convert goal chances. They had seven shots for goal with McCaffrey’s effort, as well as Flynn’s blazed shot over the bar in the first half, the only returns. In the last two games they have had a combined 13 shots for goal converting 23% (3/13). Dublin’s shooting for points was just about average – converting 44% of their shots (8 from 18). For this and the Meath game combined the Success Rate for point taking is running at 41% (15 from 37). In those two games Brogan’s Success Rate is 0% (0/5) and Connolly’s 20% (1/5). On the other end of the scale Mannion is 75% (3/4) whilst Dean Rock in his limited time has also hit 75% (3/4). Much has been made of Dublin’s missed goal chances but Cork themselves had six shots for goal only managing to come away with two points as Hurley & Goulding blasted over in the second half. Cork’s shooting in the first half, whilst sparse, was deadly accurate. They only attempted five shots from play in the first 30 minutes converting all five. Cork then had 5 attempts at scoring in two separate attacks just before half time but didn’t manage to convert any. But for two excellent blocks from the Dublin backs, with some very poor shooting at the most inopportune time for good measure, Cork may have been able to absorb McCaffrey’s early goal. Ifs, buts and maybes but Cork did expose the Dublin back line and give Kerry something to work with. Cork did reasonably well in ensuring they only gave away two frees in close to goal however discipline further out the field, and Dublin’s bombardment of the goal ensured Cluxton had the chance for a field day. Which he duly did. Cluxton’s performance was immense. None of his attempts were within 40m and though the two he missed ensures his weighting is below Cavanagh’s performance against Meath it was still the bedrock on which Dublin’s win was achieved. Obviously Cork will know who their best striker of a ball is but it was still strange to see Cahalane have three long range attempts in the first half given the quality of free taker at Cork’s disposal. The decision didn’t seem any less strange after Goulding popped over a 45 in the second half. Given that Cork had control of 62% of all kickouts it is telling that Dublin managed to create 10 more shots from all the kickouts. Usually when you see a 13:5 ratio of wins to the kickout team it is because they have gone short on the majority of kickouts thus ensuring possession. Not Dublin. They only went short on two kickouts instead having Cluxton pop expertly directed balls to players running into space. What was particularly good here was that the converted the vast majority (85%) into attacking possession. We expect this level of accuracy and execution from Dublin on their own kickouts but what did they do to Cork’s kickouts? Given the options Cork had in the diamond (Walsh, O’Connor, O’Neill, Canty) it is reasonable to expect that they should be able to pinpoint match ups in their favour. Instead Dublin got 5 more shots from Cork’s kickouts than Cork did. This had been flagged – in the Munster final Kerry got 4 more shots on Cork’s kickouts. The first port of call for most observers is to blame the goalkeeper’s accuracy but that’s not applicable here as the goalkeeper changed between the Kerry (O’Halloran) and the Dublin game (Quirke). Instead I think Cork began to believe in the core strength of that middle third and when presented with an opposition that not only identified it, but set about dismantling it, were unable to respond. Dublin attempted to break the ball at every opportunity thus negating the physical power of the Cork middle third. There was not one Dublin high fetch from Cork kickouts. Once the ball was on the ground they were ready and able to pounce – the fact that this was a team wide tactic is evidenced by the fact that every time Dublin got the ball back into the Cork 45 they got a shot off. Everybody was ready to spring into action from the predicated breaking ball. To sum it up – Monaghan’s use of possession and shooting was every bit as good, if not better, than Tyrone’s. They just didn’t have enough of the ball. They had possession of the ball inside Tyrone’s 45 a full ten times less than the average. Whilst Tyrone’s shooting was below average it was the volume of shots that ensured they kept Monaghan at arms length. Although both teams finished with 14 men Monaghan had a numerical advantage for the first 12 minutes of the second half. During that time Tyrone had four more possessions (9-5) and two more shots (7-5). Monaghan just didn’t drive home their advantage. Not sure where to comment on Cavanagh’s rugby tackle however his discipline whilst on the yellow was immense. Twice thereafter he stopped Monaghan running attacks by getting an arm in from behind; against Clerkin (49:50) & Wylie (56:18). Juxtapose this with the widely held view that Darren Hughes’ yellow card negated his ability to mark Cavanagh. For Tyrone there were wonderful contributions from that man Cavanagh (3 from 5; weighting +0.884) and two beautiful points from Joe McMahon (2 from 2; weighting +1.202). McMahon has played as a sweeper against Meath & Kildare which meant he didn’t attempt a shot from play in either game. With Monaghan not posing as great a threat (the numbers in the first table bear this out) he was able to come up the pitch and reminded us just what a threat he is when he pushes forward. After his exploits against Donegal Kieran Hughes was well marshalled with Tyrone only allowing him one shot – which he duely converted. McManus hit two peaches from the right hand side towards the end of the first half but also missed all three from the left. Clerkin (1 from 4) and Clarke’s (1 from 5) wayward shooting cancelled each other out. Looking ahead Tyrone have to be concerned about their ability to keep up with a free scoring Mayo. In the last three games their full forward line has converted a combined 14% (2 from 14; weighting of -3.905). They are only taking, on average, just over 1.5 shots each per game – and taking very poor ones at that. Excellent again from McManus. In the three games we have for Monaghan this year his aggregate is 91% (10/11) with a combined weighting of +1.909. You really can’t ask for much more from your free taker. After hyping up Tyrone’s deadball feats (see here) against Meath & Kildare they then of course throw in a comparative stinker! There were mitigants however; McCurry’s missed free was from the sideline and whilst the chances of success were low it would be hard to argue against an in form free taker having a go. Cavanagh’s two misses were from c35m-40m out whilst the second was in sector4 (the “wrong” side for a right footed free taker) after McCurry was substituted. Still the numbers don’t lie – his day was well below average. A contrast in kickout styles. Monaghan went past the 45m line on 82% (23 of 28) of their kickouts but only had a +1 differential on shots – they got six shots from those 23 kickouts whilst Tyrone got five. Monaghan’s remaining two shots came from short kickout possessions. Tyrone by contrast went short on 63% 12 of 19) of their kickouts. They botched one of those giving Gollogly a great goal chance that he blazed over but of the other 11 they got the ball into Monaghan’s 45 nine times and managed to get six shots off.